When we think back to our most memorable moments of food-related films, they’re always truly heart-warming � or at least gut-wrenching. 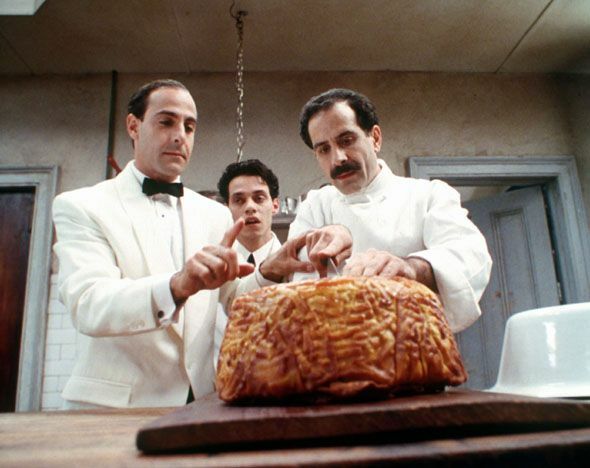 Through images, and maybe a little sizzle, food movies have the power to hit spots in us that other movies struggle with. So, love them or hate them, as food lovers, we can’t help but be hooked on food films. Here are some of our favorites to devour when the mercury drops — and the bottle we’d pair them with. This 90s classic was the directorial debut of both Campbell Scott and Stanley Tucci. , It�s a heartfelt story of food and family. Two Italian brothers, one a hot-headed chef, the other a pragmatic, philandering maitre d� attempt to save their failing Jersey Shore restaurant. Bellisimo! Pair it with: Colaneri Unita Cabernet Franc 2014. Made using traditional Italian Appassimento method of drying grapes, this red is enticing, elegant and keeps you guessing. Not unlike Primo and Secondo. The last of five coveted “golden tickets” falls into the hands of a sweet, little Charlie Bucket. What comes next for him and his grandpa is a bizarre and bewildering tour of the strangest chocolate factory in the world. Skip the remake and go for the classic! Pair it with: Hands down, The Chocolate Manifesto by Flying Monkeys Craft Brewery, who fly their freak flag high with the slogan: normal is weird. They describe this triple chocolate milk stout as a ‘euphoric detour from the mundane’ which we think is pretty darn sweet. We wouldn’t call it delicious, but this cult classic is definitely about food — or should we say, the lack of it. The story of a landlord/butcher in a crumbling tenement building to go a little nuts-oh and pull a Sweeney Todd. It’s (sort-of) a modern day Hansel-Gretel meets Romeo & Juliet meets… Hannibal. Just watch it. It’s a cannibalistic classic! Pair it with: Stay a theme with a bottle of Coffin Ridge Bone Dry Reisling. We’d suggest the Back From The Dead Red, but that’s a whole other can of worms. We’re hard pressed to find a movie starring Helen Mirren we don’t like, but Helen Mirren as the head of a Michelin-starred restaurant in a small French town who sees an incredible Indian restaurant open across the street. It’s quirky and slightly predicatable, but in an oh-so-delicious way. Pair it with: Cave Spring’s Indian Summer Select Late Harvest Riesling. It’s got loads of peach, apricot and floral aromas, with accents of lanolin, grapefruit and white pepper adding depth. Pairs perfectly with spicy food! Detailing the lives of three daughters, who come together each Sunday for an epic feast prepared by their super traditionalist chef father, EDMW is about the interplay between modern culture and values of the past — but most of all, it’s about the food. So much beautiful, glorious, food. There’s a later remake called Tortilla Soup that’s decent, but it’s edible splendor pales in comparison to the Ang Lee classic. Pair it with: Since you’re obviously ordering Chinese food, we’re going to suggest a saison. As far as a good one, we suggest the collaborative brew Maverick and Gose by Amsterdam and Great Lakes. It’s got a refreshing acidity with notes of white peach and coriander, and it’s pretty darn swell. Are wine movies that different from food movies? It�s never just about food, after all. It follows two, now-middle-aged, college roommates as they take a week-long road trip to Santa Barbara County Wine Country for one last blowout before one of them settles into marriage. Pair it with: Norm Hardie Pinot Noir, the one from Prince Edward County — a little, tucked away corner of the world. It’s no ’61 Cheval Blanc, but it’s wonderful and fruity all the same. Okay, this this ‘film’ is technically 11 short films strung together with loose themes and copious amounts of coffee and cigarettes. Each one is about two people who disagree on something… whether that be Tesla coils or music or what not. Bonus: there’s cameos by Iggy Pop, Tom Waits, Steve Buscemi and Bill Murray. Pair it with: a few ounces of Forty Creek Whisky, on ice if you like. This fuzzy, funny and unexpectedly touching Pixar film about a rat named Remi living in the walls of a celebrated French restaurant dreaming of becoming a chef proves that it�s never too late to follow your dreams. We love it, everyone loves it — it’s the perfect feel good food flick. Pair it with: a big ‘ol mug of Pluck Tea‘s Just Peachy loose leaf tea. Dried Niagara peaches and apricots make us think of warm summer days, even when it’s dreary out. Love this list? It could go on forever. Other titles we love include: I Am Love, Cloudy With A Chance Of Meatballs, Diner, The Lunchbox, Jori Dreams of Sushi, and Soul Food… to name a few!